Femme cueillant des Fleurs (Woman picking flowers) is being sold by the Clark Art Institute. Sterling and Francine Clark, who were among the great collectors of their generation, had a particular passion for the French Impressionist Pierre Auguste Renoir. Of the renowned Impressionists works in the Clark Art Institute the greatest depth is in paintings by Renoir. Their zeal for Renoir was exceeded only by enthusiasm for the American artist, Winslow Homer. Strictly adhering to the guidelines of the Association of American Museums (AAM) the Clark is deacessioning a rarely exhibited Renoir Femme cueillant des Fleurs (Woman picking flowers) It depicts Camille Monet, the first wife of Renoir’s fellow Impressionist Claude Monet. The announcement of the intended sale of the Renoir, estimated to be worth $15 million, did not come from the museum. It was issued in the press release which appears below from TEFAF Maastricht, the world’s most influential art and antiques fair. Money from the intended sale will be applied to the museum's acquisitions funds. No immediate acquition is pending. It is likely that the funds will be applied to acquire works in areas of lesser depth in the collection. We spoke with Clark curator Richard Rand about the sale of the Renoir and will file a separate report on that interview. Helvoirt, March 23rd 2011 - A major work by Pierre-Auguste Renoir from the pioneering early days of Impressionism is to be offered for sale for US$15 million by the leading international gallery Dickinson at TEFAF Maastricht, the world’s most influential art and antiques fair. 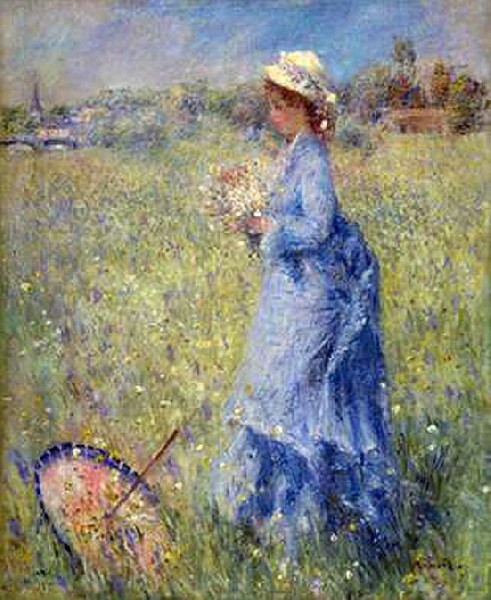 Femme cueillant des Fleurs (Woman picking flowers) depicts Camille Monet, the first wife of Renoir’s fellow Impressionist Claude Monet, who died tragically young. It is being sold through Dickinson by the Sterling and Francine Clark Art Institute in the United States in order to strengthen other areas of its collection. TEFAF (The European Fine Art Fair) will be held at the MECC (Maastricht Exhibition and Congress Centre) in Maastricht in the southern Netherlands from 18-27 March 2011.